March is a busy birthday month for my family and there have been two within the last week. 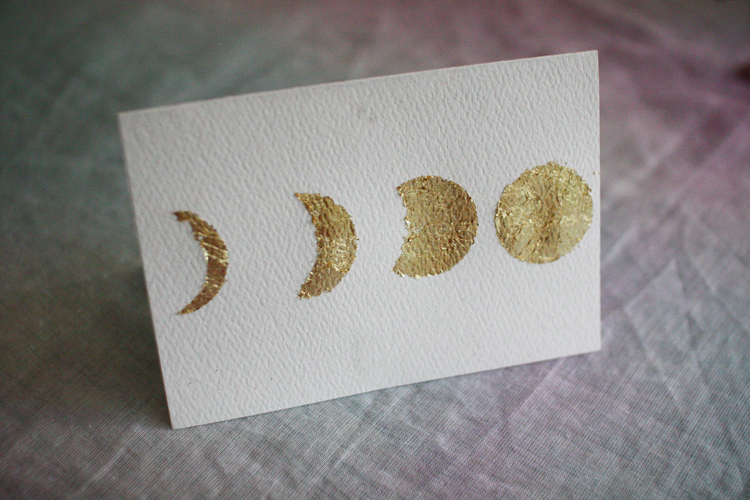 I always start thinking about moons around this time of year because of Easter approaching. 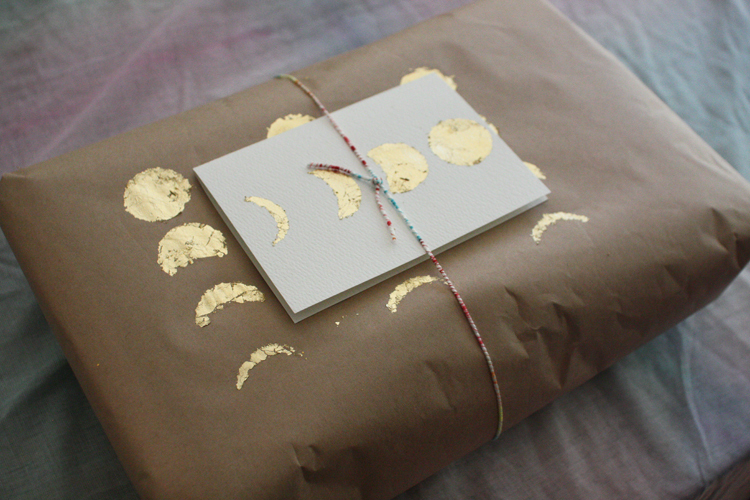 I also recently received this fantastic Avant-Garden moon phases gardening calendar from my friend Jack and it inspired me to create some moon-phases-themed wrapping. On a piece of cardboard, I used the lid of a bottle to trace four circles in a row, then on three of them I drew in curved lines to make them into crescents of increasing size. 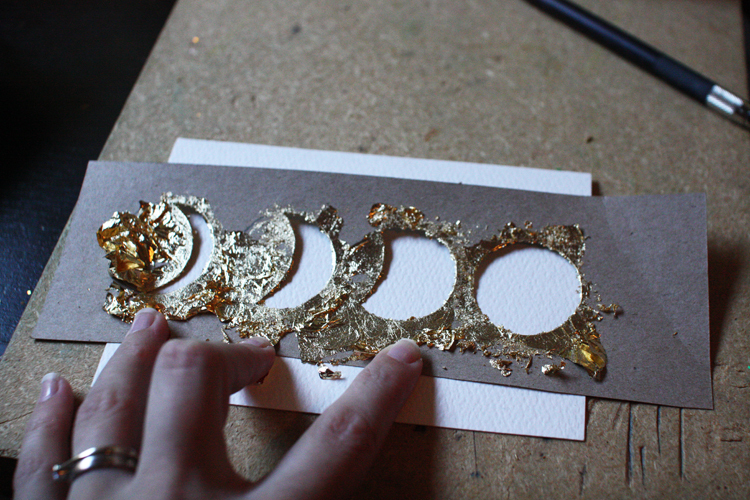 Then I used an NT cutter to cut out the crescent shapes and the final whole circle, creating a stencil with four moons. To make the card, I laid the stencil down lengthways on a blank card and, holding it tightly in place, sprayed spray adhesive over the holes. 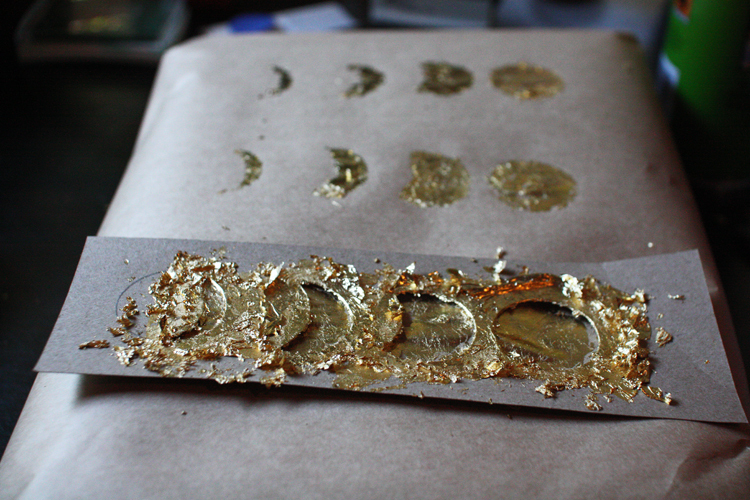 Still holding the stencil in place, I then laid sheets of gold leaf over the holes and pressed them into place with my fingers. It got a little messy but I don’t mind a bit of mess! 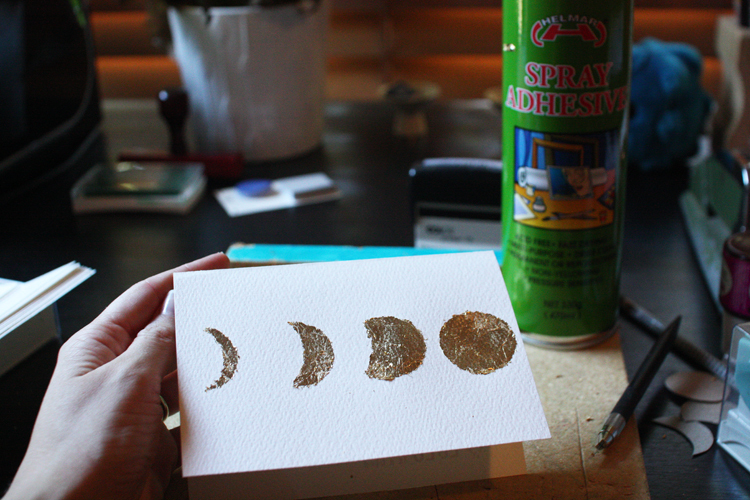 Once the holes were well-covered, I lifted up the stencil to reveal the moons underneath. 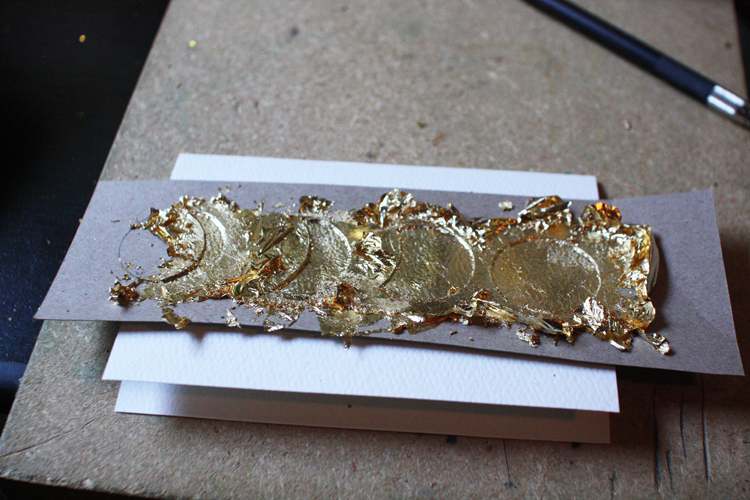 Any stray bits of gold leaf I scraped off with the cutter. 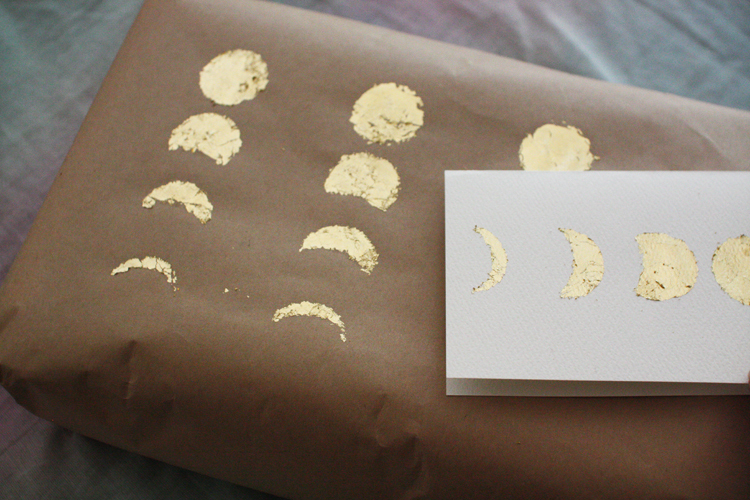 For the wrapping, I repeated the same process, making lines of gold moons across a sheet of kraft paper. For this large package (for my mum), I used three rows and on a smaller rectangular package (for my sister-in-law) I did just one row. 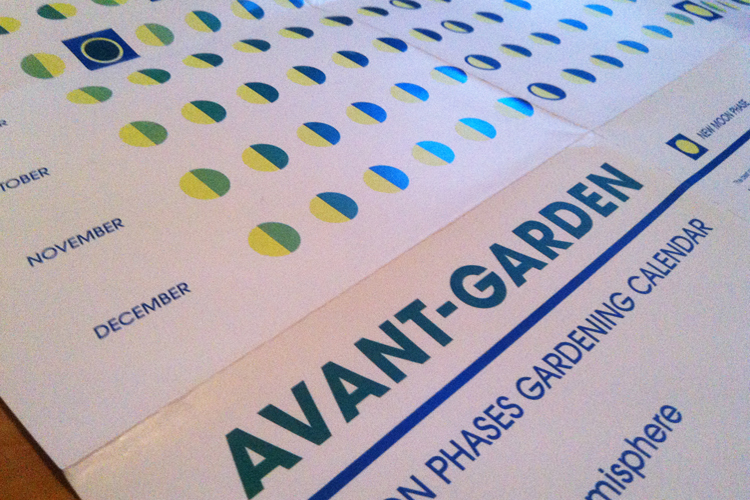 And what was inside this package? The world’s best towels, these polka-dotted beauties from Yoshii. 22 Mar	This entry was published on March 22, 2012 at 8:23 am. It’s filed under wrap and tagged wrap. Bookmark the permalink. Follow any comments here with the RSS feed for this post.